The STIRLING and SKIRLING surname, particularly in Angus (formerly Forfarshire) in Scotland. The research into SKIRLING and STIRLING and variant and 'connected' surnames continues and the Webmaster has decided that keeping all the various STIRLING pages on this site up2date is not really possible. A NEW WEBPAGE has been created in the form of a newsletter and will be updated more often than the others. You may still get information from the various linked STIRLING pages on this site, but the new one should ALWAYS be read for the latest news. The page will be dated so that you can check it occasionally. CLICK HERE for the new webpage. This page, the links and resources available are changed as new developments take place. Visit often for latest changes. WE WANT YOUR DNA TESTED !! Are YOU (or your father, brother, son, uncle, etc.) a MALE STIRLING DESCENDANT who can (possibly with our assistance) trace your ancestors? We would like to help you. PLEASE contact the Webmaster and/or look at the sites below for more detail. Do, PLEASE let our SKirling Group know if you are thinking of taking part - we might be able to assist you. A 15,500 name list of SCOTTISH STIRLINGS and now 3 lists of SCOTTISH STIRLING data - read on. This page lists some resources to be found on this site regarding persons whose surname is STIRLING, but it includes many of the former spellings of the surname which have generally become STIRLING or STERLING. A book extract about the Proscription of the Clan MacGregor. About 'British' race and new DNA developments. Read here about the SKIRLING link or even a fanciful proposition to link STONE carving and Tironensian MONKS! Currently, an important resource available here to researchers is likely to be the ALLSTIR database of persons whose surname is STIRLING, etc. - (please note that this is no longer updated as an improved list is maintained. You may still wish to refer to this list and contact the webmaster for more detail - see below. You will also find some general STIRLING surname information, in particular, the ANGUS (formerly Forfarshire) SCOTLAND links below, but also elsewhere. Please note that my ALLSTIR list does NOT have detailed STIRLING information for persons of other areas in SCOTLAND, unless the individual moved to or from, married, or died in Angus. (There are clearly at least a few dozen names who could be in this latter category - send a brief email with details if you would like me to look at my list.) HOWEVER, I now have a much less detailed list of over 15,000 records for ALL SCOTLAND - read on. Read here about the Scottish 'Lowland Clearances' which also appear to have affected the SKIRLING and many other families of the Strathmore Estate and the Earls of Glamis. STIRLING burial plots at Newmonthill Cemetery, Forfar, about 150 names, ages, addresses, dates, etc., also a large plan of the cemetery. Some Forfar history from Ken Bruce. 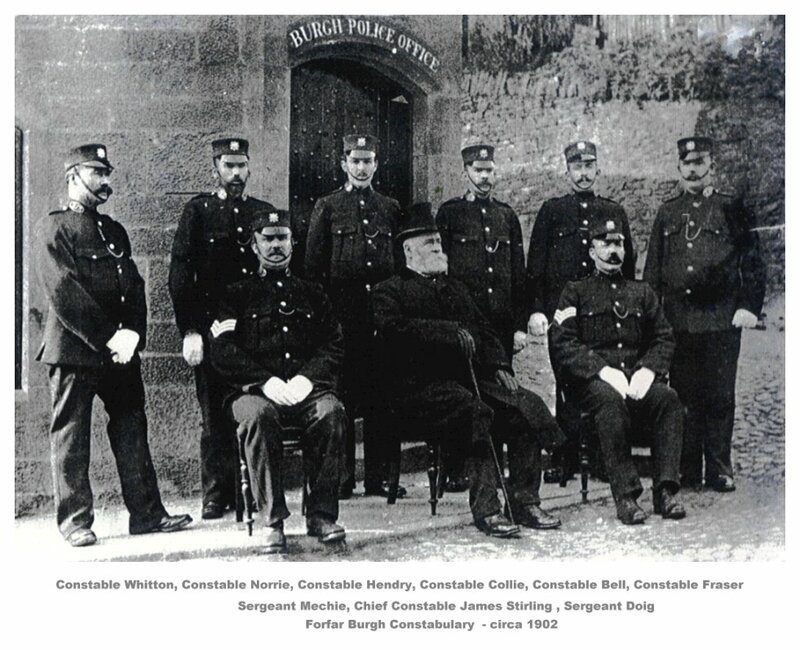 James Stirling, Chief Constable of Police at Forfar, and his (named) force. 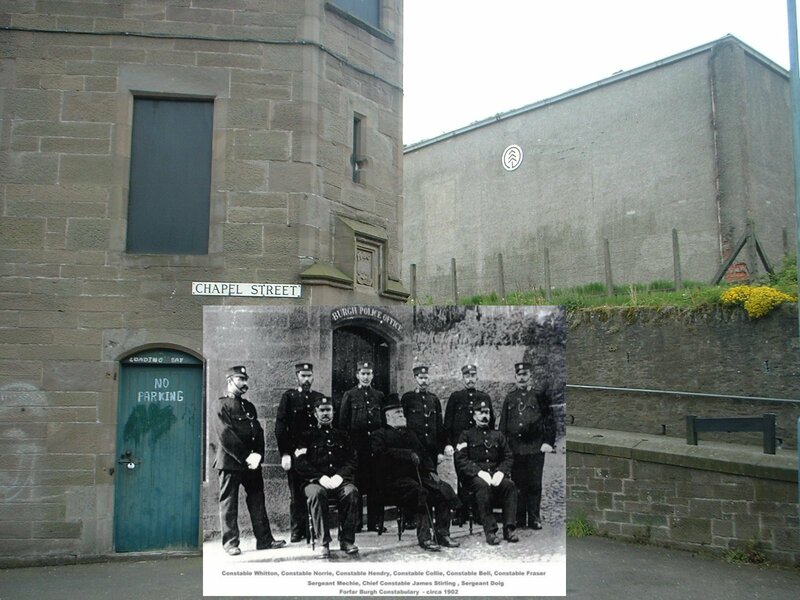 Photos circa 1902; premises NOW.
. . . but most importantly, learn about the Famous Forfar Bridie! Find out about the Stirling surname through the ages. Selected entries from the 'Register of Interments in Greyfriars Burying-Ground, Edinburgh', Scotland. 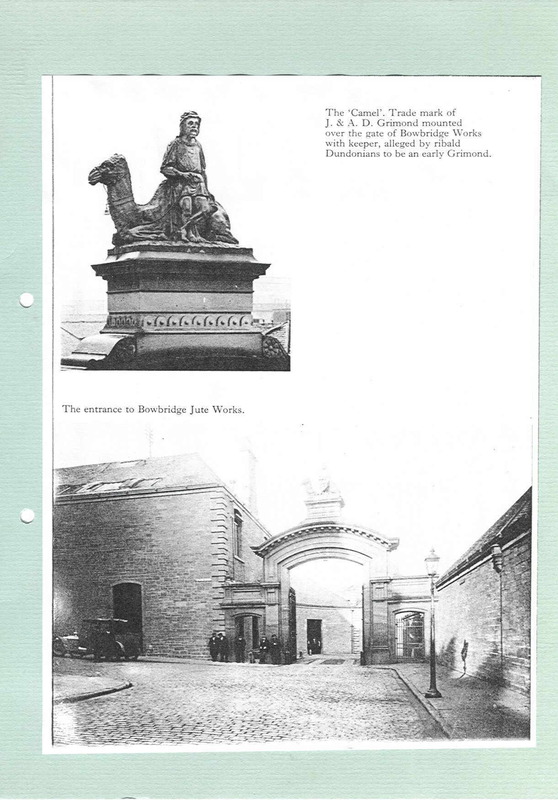 There is a Stirling Family story that an ancestor (probably with others) carved the Camel and seated figure which used to be placed above the gateway of Bowbridge Jute Works, (known better locally pronounced as 'bow brig') off of Main Street, Dundee, Scotland. Even the stories of what eventually happened to this work are varied - quite a mystery! Interestingly, the ancestor concerned lived nearby at "the Tap o' The Hill" in Strathmartine Road. 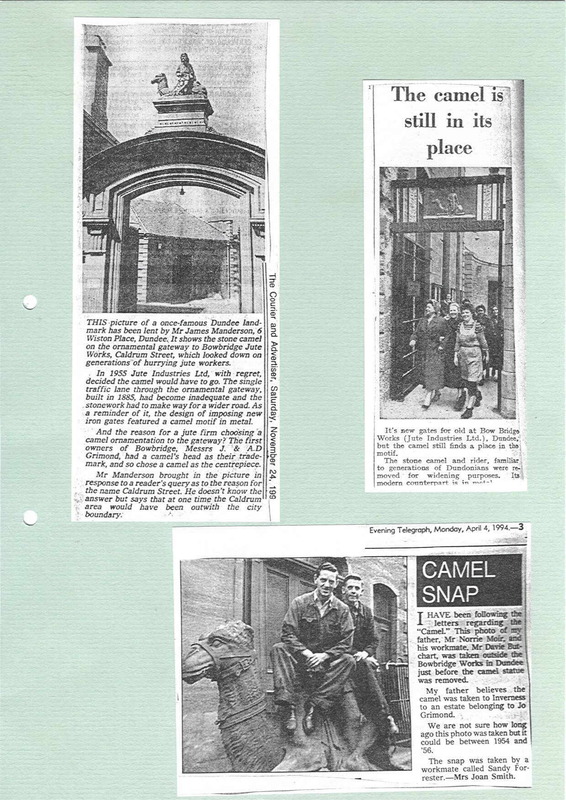 Here are three file pages of photographs and articles from the local press and elsewhere. This factory was owned by J & D Grimmond, the forebears of the late Jo Grimmond, former leader of the British Liberal (political) Party. 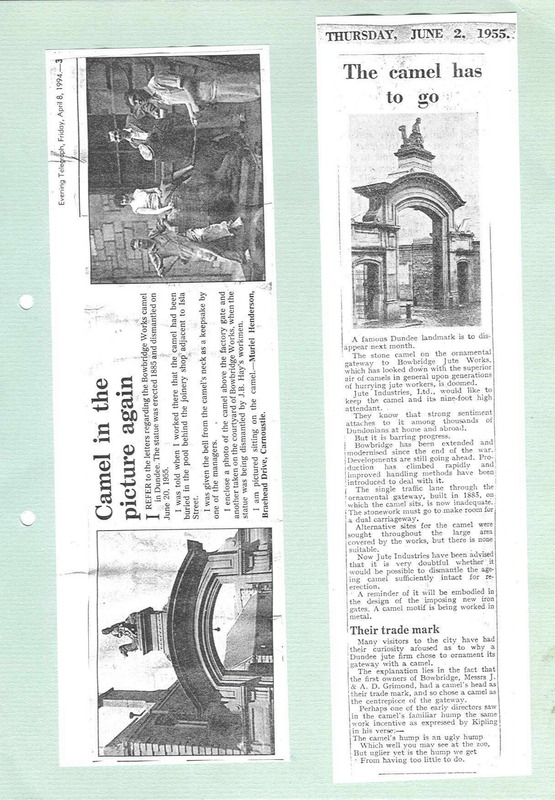 The site is now unrecognisable. Some Dunnichen interest with Stirling connections, and Nechtansmere, too. The Panbride, Barry and Carnoustie of the Stirlings and Skirlings. 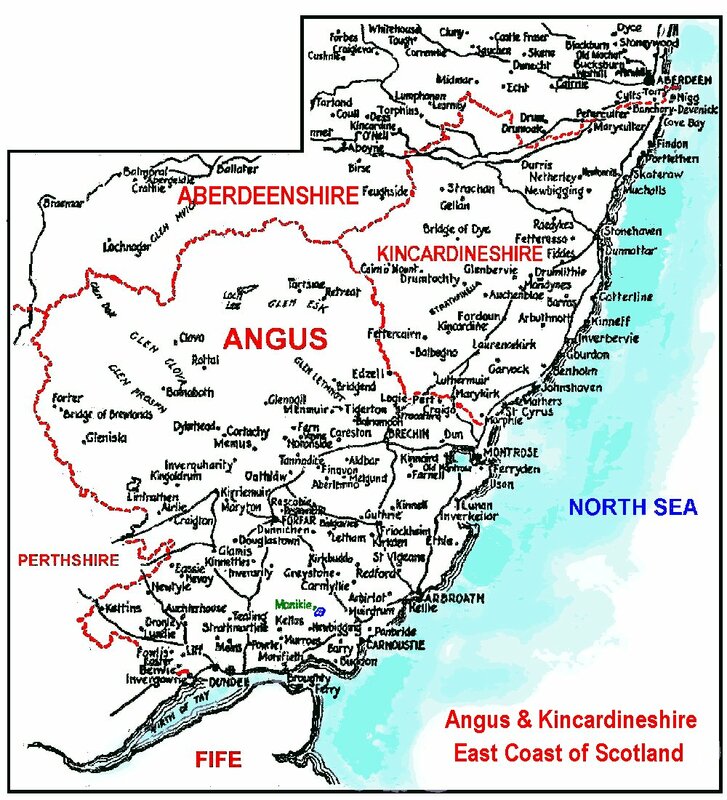 To help you find your way around this area there is a large map (326k) of Angus and Kincardineshire showing Parish and some place names. The main resources . 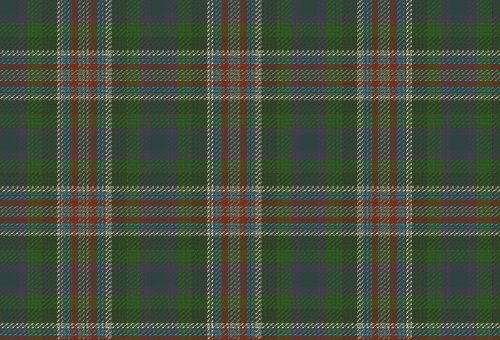 . .
. . includes STIRLINGS, etc., mostly for Angus, Scotland (also SKIRLINGS for ALL SCOTLAND) - now around 2,500 names and continually being updated! Entries from the 1881, 1891 & 1901 Census of Households for Angus, Scotland, where there is at least one person present on Census night was surnamed STIRLING. Quite a number of Enumeration Districts for the 1841 Census of Angus (including some of Dundee) have been prepared as an Excel spreadsheet - LOOK HERE. There are FOUR data lists of people surnamed STIRLING or similar for the whole of Scotland. The main purpose of these files is for research and analysis, from which the results can be further investigated. One list of over 15,500 names and three others of about 5-6,000 The three smaller files give more detail for many thousands of Stirlings. You are may wish to use all four files to further your research. If you are not already a member of the Tay Valley Family History Society and have "roots" in this area of Scotland it would be well worth your while to join - great value! As the webmaster has family history links to Ohio, here are the OHIO, U.S.A. SOCIAL SECURITY DEATH RECORDS for STIRLING & STERLING. Try entering STIRLING or SKIRLING in this website search engine for lots and lots more STIRLING entries. You are also invited to visit my CLEVELY Homepage for some information about my paternal surname.